Water kefir is a lacto-fermented pro-biotic drink made using water kefir grains that feed on sugar water and minerals. The profusion of bio-available pro-biotics in water kefir helps to improve digestive health, immune response, mood and energy levels and reduce allergic reactions, by feeding the good bacteria throughout the gastrointestinal tract. The most important thing you are going to need is of course your water kefir grains. You can purchase water kefir grains online or you may be lucky enough to have them gifted to you. Kefir grains reproduce at a faster rate than most of us can consume them, hence the tradition of gifting grains. You can freeze batches of grains, so you have back-ups. You can buy a kefir making kit but most likely you will have what you need in the kitchen. Metal utensils and metal containers are not recommended in fermentation processes as they interact with acidic elements. Glass, wood and plastic are preferred, however stainless steel is fine for straining and stirring but not storing. Water kefir grains feed on sugar water with a mineral content. Tap water is not recommended as chemicals such as chlorine and fluoride added to kill bacteria in the water will kill the good bacteria in your kefir grains. Use filtered water, bottled water or natural well or spring water. If you do have to use tap water and don’t have a water filter, make sure you do your first ferment uncovered for at least 24 hours to give any chlorine in the water time to evaporate. Some people boil the water first and find that works fine for them. When it comes to what sugar to use the most important consideration is that it is plain sugar with no added anti-caking ingredients. Plain white sugar contains no minerals. Brown sugar is white sugar with some of the molasses (removed during the refining process) added back in and will have a low mineral content. Demerara sugar is partially refined sugar cane and retains more of the minerals. A mix of 50% white sugar to 50% demerara sugar can help to keep things balanced. I like to add a little organic blackstrap molasses along with a pinch of unrefined sea salt every other batch to ensure my grains are well nourished. Do not use honey to sweeten your water kefir. Raw honey has anti-bacterial properties and will weaken your grains. Kefir grains need minerals to metabolise the sugar and function at optimal levels. Warm 2 cups of water in a saucepan. Add the molasses and sugar and stir until dissolved. Transfer the molasses and sugar solution into your jar and stir in the remaining 2 cups of water. Add your live grains to the jar. Leave to ferment at room temperature for 2 days, 3 days maximum, and your kefir water is ready to strain. At this stage you can drink it as it is, however I highly recommend going for the second ferment, which is all about carbonation. Your grains are ready to go again. You don’t have to wash the jar each time; every 2nd round will do it. With water kefir you need to keep things clean but not sterile. Water kefir grains are anaerobic so if you are using a mason jar you can close the lid. If you are worried about the jar exploding ‘burp’ it – that is just open it to let the gas escape. Alternatively you could cover the top of your jar with muslin and secure with twine or an elastic band, this method is preferred for minimal alcohol production. Pour the strained kefir water into bottles with airtight lids. Kilner swing cap or grolsch bottles are the preferred options. If you want to flavour your kefir water you can add unsulphured dried fruit, fresh fruit, juice or my favourite is lemon peel. Adding an additional source of sugar will also increase the carbonation and alcohol content. Leave to ferment for 12 to 24 hours at room temperature. The longer you leave it the fizzier it gets. If you are fearful of a bottle exploding you can store them in the fridge. I keep my bottles in a cooler box, this way if a bottle explodes the mess is contained. Water kefir has a bitter sweet tang that I like. You can flavour your kefir water by adding fresh or dried fruit, herbs, spices and even fresh flowers. If you are using dried fruit make sure it is unsulphured as sulphur, which is added to prevent spoilage, kills bacteria. If using fresh fruit, ferment for 24 hours maximum to prevent spoilage. If you are giving fruit flavoured water kefir to children be aware that longer ferments and added sugar content increases the alcohol content. 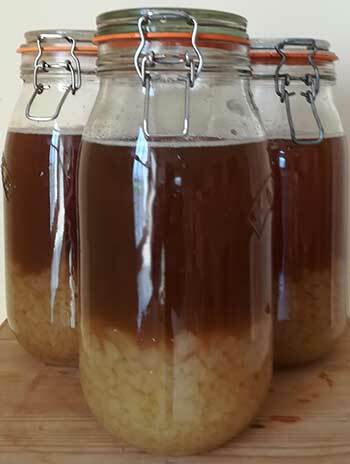 Instead you might want to make a cocktail of 50% water kefir to 50% fruit juice – and if you do ferment further limit it to 12 hours in the fridge. You can add small amounts of sliced fresh fruit such as strawberries or apple, whole blueberries, or fresh edible flowers such as primrose, borage or nasturtium. Organic fruit juices are another popular addition, or try vanilla extract for a cream soda. I like to soak herbal teas overnight in kefir water. Red rose petals produce a particularly delicious brew. Marshmallow root produces a sweet roundedness that has a particularly nice ‘mouth feel.’ Other starchy roots such as burdock, liqourice, nettle and dandelion root each have a distinctive taste. Starchy herbal roots are rich in pre-biotics that can help to support a healthy microbiome. Experiment and see what you like. 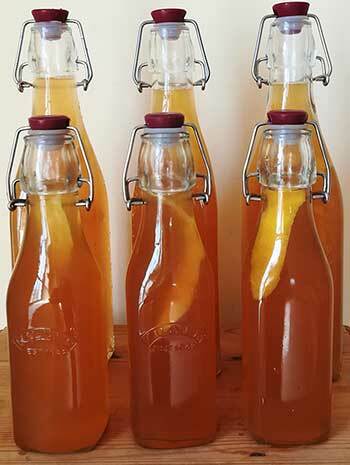 Alternatively just add some of your favourite herbal tea to your kefir water before bottling. Similarly you can boil up your fresh or dried herbal roots, seeds, dried berries or barks for about 20 minutes, strain, allow to cool and add to kefir water before bottling. The amount of alcohol in water kefir is generally quite low. It can range from less than 1% to 3% depending on the temperature and soaking time. How much alcohol your kefir may produce is limited by the amount of heterofermentative bacteria in your grains, which produces lactic acid, alcohol and carbonation. The alcohol content of your water kefir will depend largely on how much sugar you feed your grains, the temperature it ferments at, and the length of time it has to ferment. The higher the sugar content the higher the potential alcohol content. The amount of grains in your first ferment will influence how fast it ferments. For example 2 cups of grains will break down 2 cups of sugar faster than 1 cup of grains. Temperature also influences how fast your kefir ferments. The warmer it is the faster the ferment. If you are going to be away or need a break you can slow things down by placing your jar of kefir grains in soak-water, in the fridge for up to 1 week at a time. Storing your first and second ferments in cooler boxes or containers will contain any explosions. I had a bottle explode in a cupboard and that was much more time-consuming to clean up than a bottle that exploded in my cooler box. Cooler bags can also work to contain potential explosions and maintain cooler temperatures during the summer months.